Wes Moss: Would You Pass this Money and Happiness Quiz? I’ve recently released a new book called, “You Can Retire Sooner Than You Think,” and in it, I analyze the financial bare minimums needed for retirement, along with the different traits and habits between happy retirees and unhappy retirees. I have actually answered the question that we have all heard, “can money buy happiness?” Though people will always argue one way or another, I have collected quantitative research that has been backed by Georgia Tech’s Mathematics department that actually answers this question. Yes, money can buy happiness; however, it is for less than you might think. One of the interesting findings in my research was that more money and more income does increase happiness, but only to a point when it begins to level off. Effectively creating a plateau effect between money and happiness. After you have reached a certain amount of money, it only makes you marginally happier. I believe this goes back to my last blog post about having balance with your progress in life. In conjunction with my research on financial levels of what makes a happy versus unhappy retiree, I was also able to learn about the various traits and habits of these groups. Several of these truly stood out to me as important markers in what can make or break a happy retirement. Can you answer the below questions? Do you feel like you have a well defined understanding of your purpose in life? How many activities and interests do you love to pursue? How long until you pay off your mortgage? 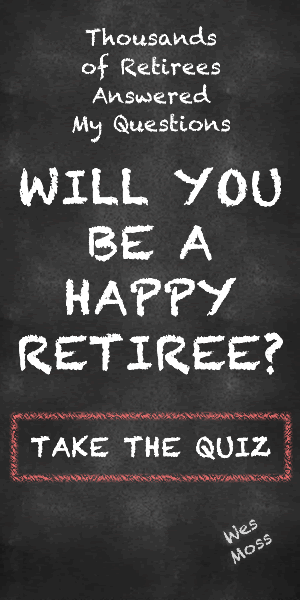 How much time do you or did you spend planning for retirement each year? How much do you have saved in your retirement account? How many vacations do you take each year? In my book, I explore the above questions and more, and compare the results between the happy and unhappy groups. If you aren’t ready to buy the book, head over to www.WesMoss.com and take my free quiz to learn which group you fall into along with several suggestions that might help you tune up your money happiness quotient. It’s never too early to start thinking about retirement, so pick up my book today so you can retire early and happy.